April Showers Bring New Ciders! We’re very excited for the onset of spring and have a ton of great events to share as well as some excellent new ciders including a couple of collaborations. Join Steve Jones and Adam Lindsley for the release of their new book on beverage and cheese pairing, Cheese Beer Wine Cider. We’re thrilled to say that one of our ciders is a featured pairing. 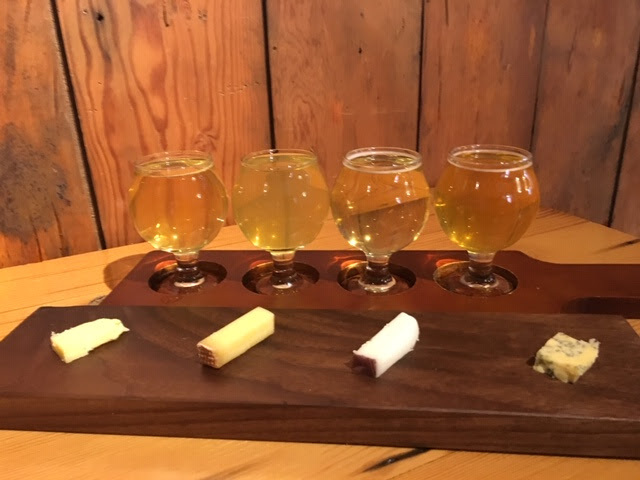 Come by the pub to taste this pairing and other amazing cheese and cider pairings curated by Steve Jones from Cheese Bar. Pick up a copy of the book and get it signed. Six years ago Cider Riot! began in earnest as Abram Goldman-Armstrong set about converting his North Tabor neighborhood garage into a fully licensed production cidery. To celebrate we’ll be tapping some very special casks of cider, including 2018 Kingston Black single varietal, and Pyder, a Welsh style perry-cider blend. We’ll also be offering limited edition patches for just $3 (normally $5). We’ll also be pouring flights of 1763 from 2013, 2014, 2015, 2016, 2017, and a sneak preview of 2018, taste how proper cider made from tannic bittersweet cider apples can evolve over time. Stick around afterwards or stop in any Thursday 8-close for the Biddy McGraw’s traditional Irish session. Join fiddle, bodhran, whistle, banjo, uileann pipe players and more for the ceol agus craic. 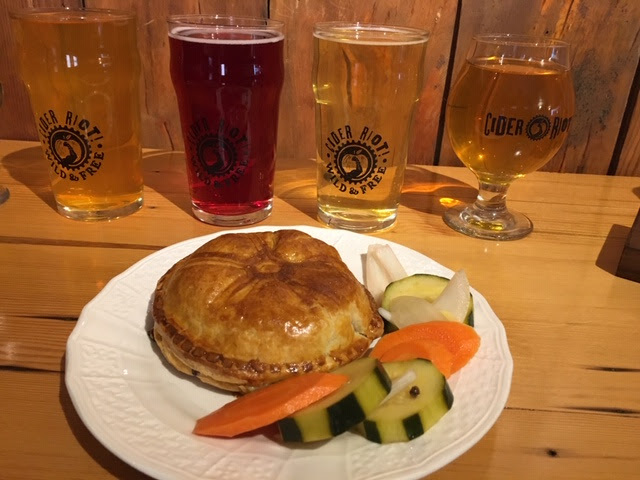 Starting Easter Sunday, we’ll be serving small plates including house-made pickles, made with vinegar made from cider apples, cheese and cider pairing flights, ploughman’s platters, samosas, and locally made spinach and mushroom pies. The menu is inspired by English pub food, and we’ve all the proper condiments, from brown sauce to Coleman’s mustard. You’ll still be able to get amazing Mexican food from No Q No Taqueria in our patio and bring in your own food. Offering our own menu also means minors will be welcome Sundays when No Q No is shut. Sign up for special offers, and new cider alerts Join our VIP club by texting “cider” to 503.549.1090 and we’ll keep you in the loop on new releases, rare tappings, and exclusive discounts. Live out of the area and want to get some of our cider? Visit our online store at ciderriot.com or at bevv.com. (Current states that we can ship to: OR, WA, CA, MT, AK, MN, FL, DC, other states please enquire, some require low cost permits, others i.e. TX are not feasible). Local customers can also order for delivery to your door, including freshly filled Action Growlers. Made in Collaboration with Market of Choice stores, and named for our favorite Aussie soap opera, Home and Away Mango Raspberry cider will available statewide at Market of Choice stores in cans beginning next week. Stop by your local MOC or the pub to pick up a 4-pack. We’re getting another run of our ever-popular American Apparel hoodies, email Abram: abram@ciderriot.com with your size and phone number to reserve yours today and we’ll text you when they are available (likely by the anniversary party), and get $5 off the usual $45 price. We also have a new batch of scarves available. Edword, The Globalist, The Hajj, G.F.L. We’ve joined forces with Bit House Saloon to make a special cider for their upstairs club, the Crow’s Nest. A portion of this semi-dry cider is aged in Ransom Gin barrels for oaky funk and the slightest hint of gin. Join us over at the Bit House for a night of punk and metal as we celebrate this collaboration cider. Celebrate International Worker’s Day with live music from Anti-Sycotix, Trash, Charlie Mopps, and Dj’s Soul Survivor, and Dark Entries.